It’s those four-digit passenger counts that can turn cruise ships into the strip mines of tourism when it comes to their impacts on small port cities. 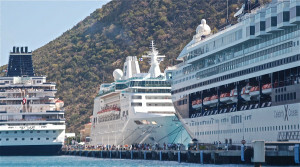 Three ships at once are common for Philipsburg, St. Martin, and they have turned the once-charming capital—a mini-isthmus consisting mainly of Front Street and Back Street—into yet another duty-free shopping mall, increasingly disconnected from the host island’s history, culture, and traditions. Every day, passengers flood the town in numbers that that far exceed the resident population. Yet they contribute far less per person to the local economy than the average stayover tourist, most of whom find the mass crowds repellent. Repelling your most profitable tourists is not a good long-term strategy. The World Monuments Fund and others recently sponsored a conference in Charleston, SC, on cruise-ship impacts in historic ports. Several speakers cited various studies that question the rosy economic-benefit figures touted by the cruise industry, finding instead that the percentage of passenger dollars remaining in the destination is negligible. In ports like Philipsburg, for instance, passengers may not even buy lunch, instead returning to their ships. For more on the conference findings, see National Geographic NewsWatch and the New York Times. And if 3,600 passengers seem like a lot, just wait until you see your first Oasis-class ship, carrying more than 8,000 passengers and crew. Is here any sustainable way for port cities to manage these floating counterparts? One answer may lie in Hong Kong’s new cruise terminal, set to open this year and eventually capable of taking two Oasis-class vessels simultaneously. Here’s why. Whether a port of origin or a port of call, Hong Kong is so populous it can easily digest an extra 10,000 or 20,000 people without much of a burp. Cruise crowds can’t overwhelm it. Second, the terminal’s location out on the old Kai Tak airport runway serves as a perfect filter for the cruise folk: Those who are sincerely interested in this thrilling city can easily go back and forth on shuttle services, while those more inclined to relax in the embrace of cruise amenities will have plenty right there at the terminal. In short, cruise crowds belong strolling the decks on board or the streets of major cities, not smothering small ports like Venice, or Charleston, or Dubrovnik, or Philipsburg. This entry was posted in All, Findings, Stewardship and tagged carrying capacity, Charleston, cruise, heritage, Hong Kong, mass tourism, Philipsburg by Jonathan Tourtellot. Bookmark the permalink.